Instantly send a message from your iPhone to your Apple Watch; then respond using the Watch app which will appear at the top of the iPhone app. 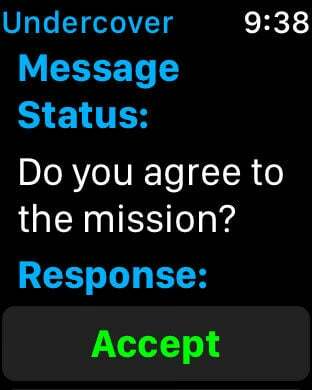 Give your iPhone to a friend and wear the Apple Watch whilst they send you missions to complete, and then reply if you accept it! Become the spy you always wanted to be with Undercover!